PARIS, FR. 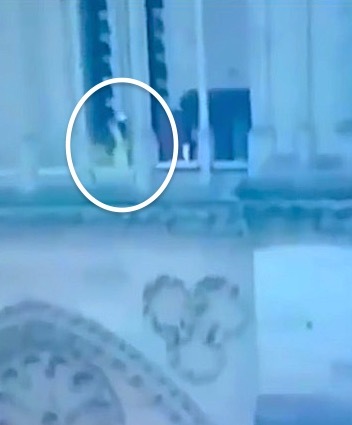 (THECOUNT) — Who was the man caught on a TV camera walking on the exterior of Notre Dame cathedral today? That is the burning question some are asking on social media following the catastrophic blaze. While emotions run on high over the incredible loss of a majority of the historic building, some are taking the conspiracy theory route at this early stage in the investigation. @therealcornett BREAKING: No workers present at the time that the Notre Dame Cathedral fire started……So who is this guy dressed in Muslim garb?? A man in a light colored robe and and head covering could be seen moving swiftly from left to right across the screen and then behind a column as the fire burned in the background, reports TheAmericanMirror. With modern technology, images can now be inserted into moving pictures almost flawlessly, therefore, TheCount.com can not verify the veracity or authenticity of the clip. Some folks on social media are also quick to point out the Notre Dame blaze follows a fire occurring at another of Paris’ historical church, Saint-Sulpice, which went up in flames March 17, 2019. The historic church first opened its doors in the 19th Century. Firefighters were sent to deal with the blaze early on a Sunday afternoon, Le Parisien reported. According to the newspaper, the Saint-Sulpice church wooden doors were on fire, and a stained glass window was damaged. The rest of the damage “seems minor,” RT is reported March 17.